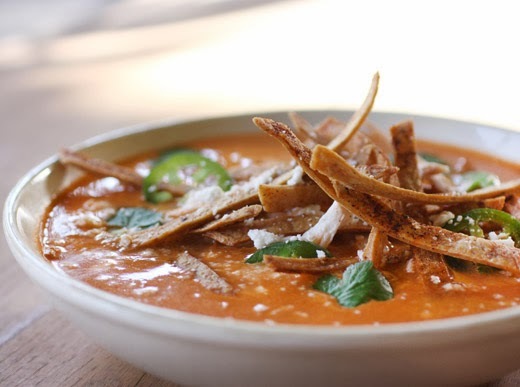 I didn’t know about tortilla soup before I moved to Austin, but I quickly became a big fan. It’s one of those things, like chili, that everyone makes in his or her own way. Several local restaurants serve different versions of it. Sometimes, it’s a brothy soup with chunks of tomatoes, chiles, and chicken that gets topped with crispy tortilla strips, shredded cheese, and chopped avocado. Other times, the soup is thickened with tortillas cooked in the broth. And, one version that I like a lot is made thick with a puree of softened, dried chiles that sends it in the direction of mole sauce as soup. What I’d never tried, however, was a silky, pureed tortilla soup with the addition of butter. It’s a recipe from Chef Rene Ortiz of Austin, and it appeared in Food and Wine magazine last May. This was so different from other tortilla soups that I followed the instructions for the toppings to the letter. Since the soup is nicely rich with butter, it doesn’t need the usual, gooey, melted, shredded cheese. Instead, this was topped with avocado, cilantro leaves, sliced jalapeno, tortilla strips, and just a few crumbles of queso fresco. The soup is started by sauteing white onion and garlic. Next, tomatoes are added, and since it’s not tomato season, I used canned. Chipotles in adobo were added as well, and you might want to start with two and decide if you’d like more or not. 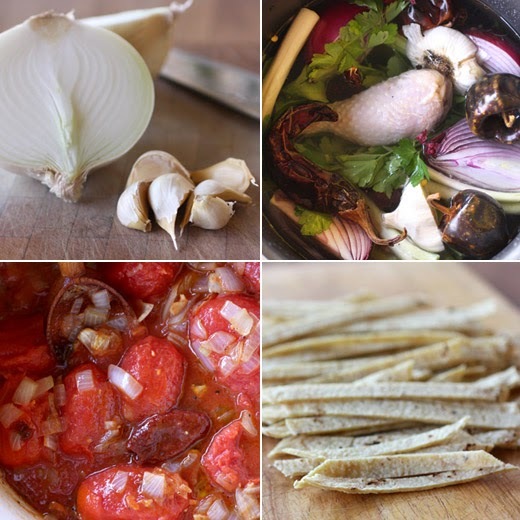 The recipe suggests four which make the soup nicely spicy with a layer of smokiness. Chicken stock is added with the tomatoes and chipotles, and good soup results from good stock. I made a stock with chicken legs, lots of vegetables, and a few dried chiles I had in the pantry. As the soup simmers, you can fry tortilla strips for garnish. Any shape will work from strips to shoestrings to little squares. After the soup has cooked away for 30 minutes or so, it’s then pureed in batches in a blender with butter. One stick of butter was cut into pieces, and a few were added to each batch to be pureed. Either let the soup cool before pureeing, or blend in small batches that only fill the blender pitcher about one-third to one-half of the way. Then, if the soup is hot, remove the plastic inner piece of the pitcher lid, and hold a towel over the opening as you pulse the blender on and off. That way, steam can escape, and the pitcher lid won’t shoot off the top when you start the motor. Once all the soup is pureed, it’s ready to be re-warmed and then served with toppings including shredded chicken, crispy tortilla strips, avocado chunks, sliced jalapeno, cilantro leaves, and crumbled queso fresco. The smoke and chile heat from the chipotles were lovely. And, lots of crunchy, corn tortilla strips are a great contrast to the silky texture of the soup. I don’t think I could choose an all-time favorite version of tortilla soup since I like them all so much, but I have found yet another unique, delicious, and easy-to-make approach to add to my list of options. Tortilla soup is great! And you're right there are so many different ways to make it. This looks rather different, which is always a good thing! Really nice -- thanks so much. Gorgeous flavors. This soup looks so comforting! I still don't know much about tortilla, more the word itself. But the soup looks great, so warming! Such a comforting and flavourful soup! I have never had tortilla soup but it sure looks good. 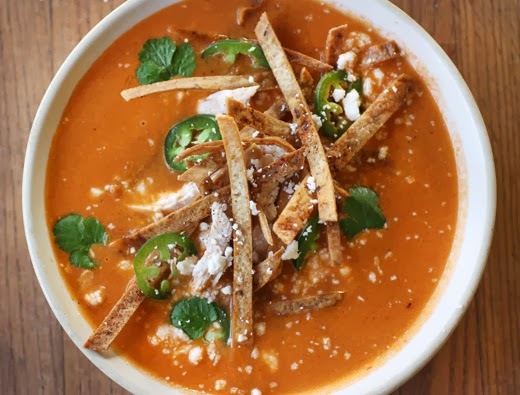 I've only had the chunky kind of Tortilla Soup but I suspect Chef Ortiz's version is fabulous! With our weather going back to cold a warming spicy soup sounds so enticing! Lisa, I think this recipe takes tortilla soup to a much higher level! I am not too fond of the regular stuff sold in restaurants, ordered it a couple of times, did not quite get why so many people would go crazy for it. You must be psychic! This is exactly what I've been craving for the last few weeks and haven't made yet. I like that you made a rich chicken stock. Homemade stock makes all the difference here. this is much more thoughtful and complex than most tortilla soups i've eaten. magnificent creation, lisa! It's the toppings that complete me, I mean the soup! Dear Lisa, I was never familiar with so many different flavors and spices until recently. I love these new flavors and add them to so many dishes now. I love this rich and creamy soup and I like the added heat. Delicious! I like tortilla soup, but yet have to make it at home...yours looks fabulous...flavorful and spicy...yum! Lovely flavors. The crunchy tortilla must taste so perfectly with the soup. Love it. I love tortilla soup and yours sounds great with the chipotle…spicy and flavorful. Perfect for our cold weather. Love tortillas but I've never made a soup from it...great idea! Looks delicious and it's perfect this time of the year here in CT!